One of the things that we love in this house are Fajitas. You can go out for them and pay, but I prefer to make them at home because they normally taste pretty close to the same . I always like to be in the comfort of my own home when eating something messy too haha. I started out with two really nice steaks that I got on sale for less than $6 for 4 pounds. I seasoned it liberally with coarse Sea Salt (The bigger the better), pepper (Always white when it comes to this house), some Burger Seasoning, and stick it all in a bowl. Throw in a bit of hot sauce and mix it all up. The hot sauce helps the seasonings stick to the steak. YUMMY! I sliced the steak up into long strips and then sliced across. You want the pieces small enough to fit inside your Tortilla shell without being too big that you can’t close it properly or eat a piece without it falling out. Then cook your steak to your liking. Remember that you don’t want to cook it too well (even if you like it well done) because it will make it more tough when you are eating it. 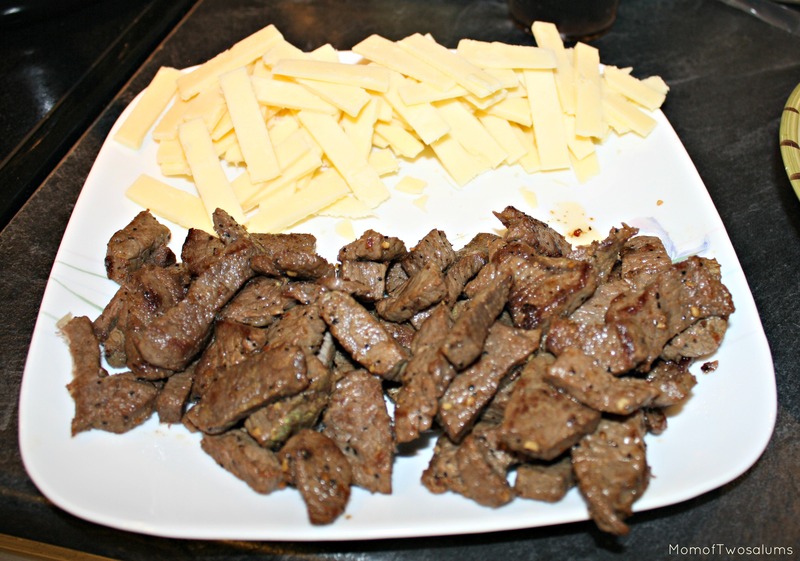 Set your meat aside and cut up your cheese into strips. 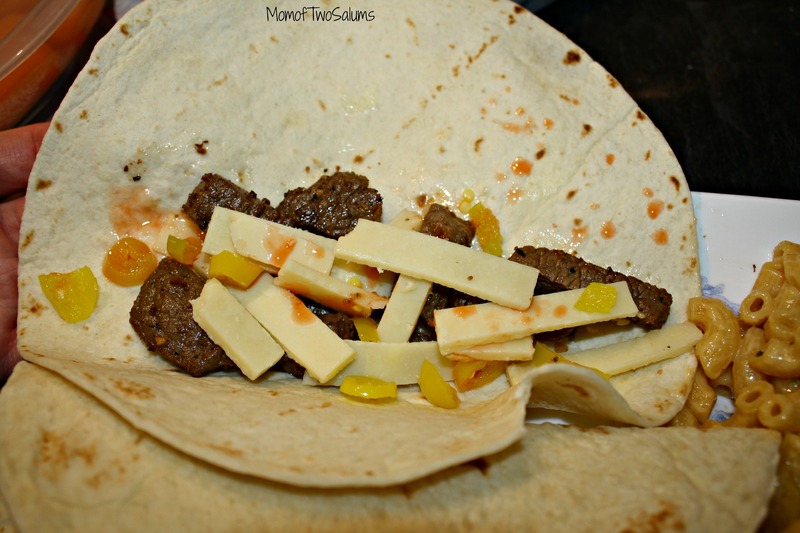 I like to use extra sharp white cheddar, cut up some Jalapeno’s and whatever else you like. Normally we add some sour cream, lettuce and onions but we wanted a quick meal so we just kept it simple. 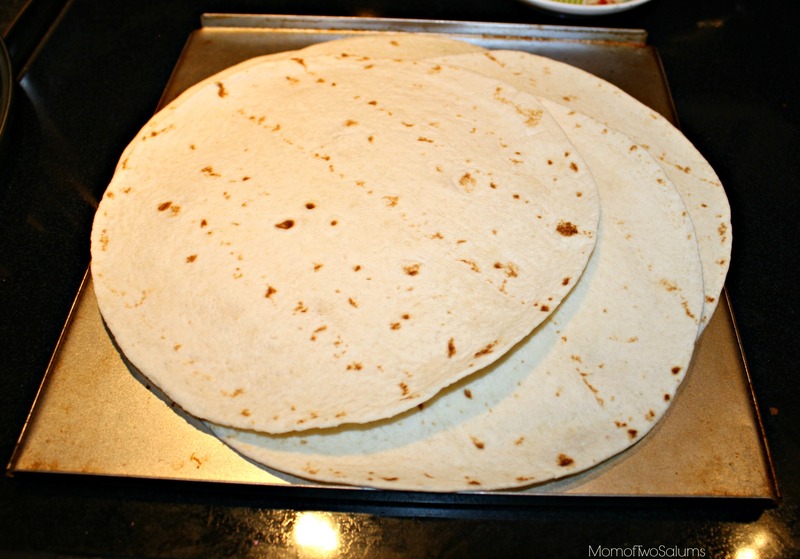 You also want to heat your tortillas up. A lot of people skip this step, but the best reason why I can give you to do it is because they are more pliable. They tend to fold up a LOT better when they are warm not to mention they taste way better. So trust me, if you normally don’t heat them just try it once. It only takes a few minutes because you just want them to be warm to the touch, not piping hot. You will also notice that there is a nice helping of Mac-n-cheese on his plate… this is the new Jalapeno Mac-n-Cheese from Kraft. It. is. delicious. 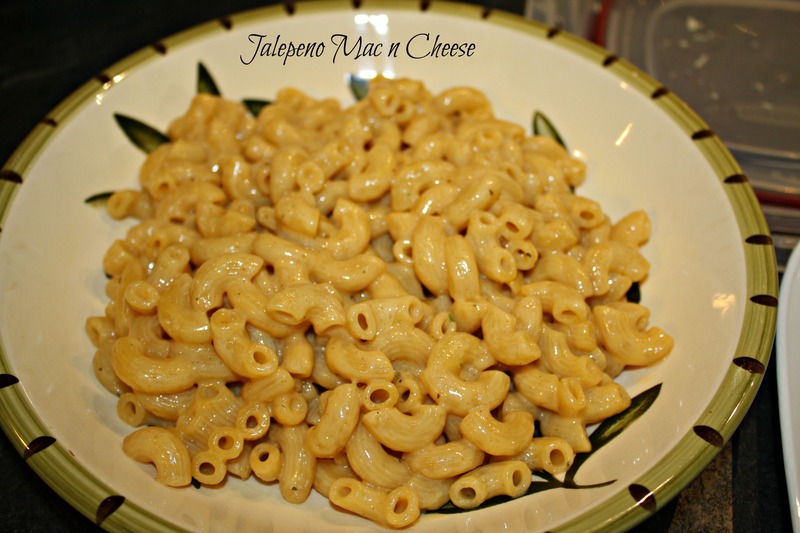 If you don’t have it available then what you can do is make your own version of Mac-n-cheese.Then put your Jalapeno’s through a food processor,but don’t have a heavy hand because you don’t want a paste, you want them to be chopped very finely. 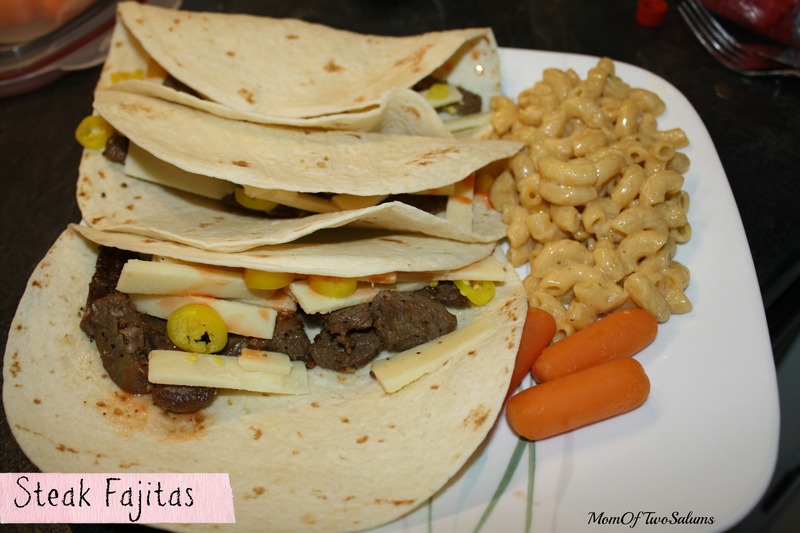 Set them aside and take a few different kinds of cheese…. I like some Asiago and a really extra sharp cheddar (as in the one you used with your fajitas). I do recommend tasting your cheese together though. Some people like Asiago but don’t like it with Cheddar. I hope you enjoyed this recipe. If you have anything you would like me to try, or think I would be interested in send it my way. Also if you try anything please please send me a pic. I would love to pump up my Viewer pics section and add your picture to it. Just let me know how you liked it, if you changed it or made it the same way I did.